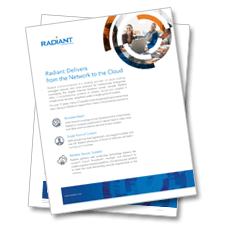 Radiant understands the need for enterprise-class security, reliability, network visibility and control. We deliver seamless end-to-end managed network and cloud hosting solutions that allow organizations to maximize IT efficiency and productivity. Radiant is uniquely positioned as a national, single source provider with a full voice and data portfolio. We can provide network coverage anywhere in Canada or the U.S.
Our dedicated account team is your single point of contact and delivers an unrivaled customer experience; the smart alternative to working with multiple vendors and contacts. Radiant has the expertise to deliver customized services based on your specific requirements and the flexibility to be responsive to your needs. Experience supporting over 20,000 business locations across Canada and the U.S.